Human activity is very dynamic and subtle, and most physical environments are also highly dynamic and support a vast range of social practices that do not map directly into any immediate ubiquitous computing functionally. Identifying what is valuable to people is very hard and obviously leads to great uncertainty regarding the type of support needed and the type of resources needed to create such support. We have addressed the issues of system development through the adoption of a Crowdsourced software development model . We have designed and developed Anywhere places, an open and flexible system support infrastructure for Ubiquitous Computing that is based on a balanced combination between global services and applications and situated devices. Evaluation, however, is still an open problem. 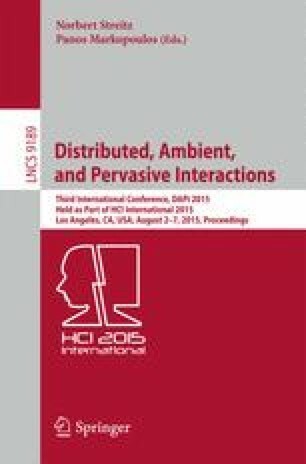 The characteristics of ubiquitous computing environments make their evaluation very complex: there are no globally accepted metrics and it is very difficult to evaluate large-scale and long-term environments in real contexts. In this paper, we describe a first proposal of an hybrid 3D simulated prototype of Anywhere places that combines simulated and real components to generate a mixed reality which can be used to assess the envisaged ubiquitous computing environments . Research group supported by FEDER Funds through the COMPETE and National Funds through Fundação para a Ciência e a Tecnologia under the Project UID/CEC/00319/2013.